The message has been circulating for a few years now: trans fats = bad. It’s one of the rare times I find myself in alignment with conventional nutritional guidelines. (Of course, it’s not so simple, but I’ll unpack that one in a moment.) The fact is, manufacturers have done a better job sending the anti-trans fat message than public health agencies. Everywhere you turn in the grocery store the “No Trans Fat!” tag leaps out at you, complete with manic font and exclamation point, from hundreds of boxes, bags, and packages. (“Well, it must be healthy then!”) Unfortunately, the marketing push has crowded out the real science when it comes to the public’s engagement with the real issue. As you can guess, there’s more to the trans fat picture than the self-congratulatory manufacturer claims. I know trans fats are unhealthy and I avoid them like the plague. But like so many things sometimes I need a little reminder why. (I regularly brush up my knowledge by visiting your site so that when a friend asks why I avoid grains I don’t say something like “Grains are bad because… something about lectins and phytates – can’t remember why… but they’re bad.”) Could you write up an easy to remember primer on what trans fats are and why are they unhealthy? Thanks to Monica for this week’s question. Order up. First, a brief update on the subject. Since 2006, when the FDA required food manufacturers to include trans fat content on nutritional labels, the prevalence of these partially hydrogenated oils has indeed changed. Shifted, really. Actually, these seedy little grease balls, devious criminals that they are, have gone undergone a strategic makeover and/or simply gone underground. They’re still operating among us, trust me – business as usual. But let’s break it down first. “Shape shifters” is incidentally an apt way to describe trans fats. That’s exactly what the hydrogenation process involves. From a chemical standpoint, you take a decent enough unsaturated oil and add some hydrogen atoms. The process undoes the existing double carbon bonds of the unsaturated oil. By “saturating” the bonds with additional hydrogen, you saturate the oil. The result is a solid (at room temperature) but meltable, more stable fat. Seems simple enough, but all of a sudden the body doesn’t know what to make of the end product. The trans fats go on to incite havoc in cell metabolism. Research indicates trans fats cause comparatively more weight gain than the same diet with monounsaturated fats and a redistribution of body fat tissue to the abdominal area, the riskiest place to carry extra padding. Additionally, they’re associated with inflammation and atherosclerosis. Generally speaking, all the garbage a good Primal eating plan avoids: margarine, shortening, pastries, donuts, muffins, biscuits, cookies, cakes, frostings, pies, crackers, chips, bread, instant flavored coffee drinks, microwave popcorn, and the usual fast food suspects like fried chicken, chicken patty sandwiches, French fries, etc. Consider anything fried suspect. The concern has even spurred local and state governments to regulate public consumption. New York City was the first in July of 2008, when the law that banned trans fats in city restaurants took effect. With the recent flip of the calendar, the State of California added itself to that list of regulators. 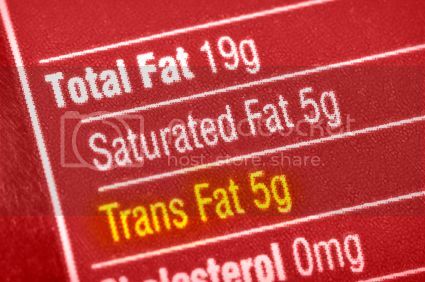 Although many restaurants and food manufacturers scrambled to create new formulations following the 2006 labeling rule, trans fats have all but disappeared. Some food producers, counting on consumers’ penchant for their products as-is, said label be damned and kept their formulation the same. (A quick rundown of fast food nutritional info or any frosting canister shows as much.) Other companies took advantage of the labeling loophole that allowed any content under .5 grams to be listed as zero. Considering that the American Heart Association suggests a 2 gram/day ceiling on trans fat intake (based on a 2000 calorie/day diet), it seems pretty likely that processed food consumers still have a solid chance of meeting that limit and then some. Ignorance may be bliss to these folks, but it’s not well-being. Finally, trans fat content in many cases has simply morphed into what’s known as interesterified fats. Consider them trans fats’ partners in crime – a real Bonnie and Clyde duo. Essentially, interesterified fats provided manufacturers the same crispy, flaky, shelf stable benefits they were accustomed to while offering a convenient way to circumvent the new laws and labels. Interesterified fat combines unsaturated and the saturated fat stearic acid in a process that includes the same hydrogenation and a reshuffling of fatty acids. The result, like artificial trans fat, is a product that doesn’t exist in nature. Research shows their impact to be even more insidious than trans fat. Think both insulin resistance and a negative shift in LDL/HDL ratio. The best way is, of course, to avoid processed foods themselves. As far as labels go, check the trans fat content but also the ingredient list for words like partially hydrogenated, hydrogenated (which usually means “partially”), and high stearate, and stearic rich. What’s Behind the Natural versus Industrial Trans Fats Comparison? Perhaps you’ve heard that meat and dairy products contain trans fats as well. Technically, this is true, but the industrially produced trans fats aren’t to be conflated with the natural kind, called vaccenic acid. The digestion process, particularly the stomach bacteria, in ruminant animals naturally adds hydrogen. The result is a small amount of natural trans fat in the animals’ meat and milk that offers a number of benefits, including antiatherogenic effects. Conjugated linoleic acid (CLA), part of the family of naturally occurring trans fats, is a health powerhouse. Unfortunately, about 80% of Americans’ trans fat intake is the artificial class. As is so often the case, there’s a tendency to throw the baby out with the bath water when it comes to nutritional guidelines. The rule here holds as it always does: the natural, Primal stuff nourishes the body, the artificial stuff undermines it. ‘Nuff said? Be sure to weigh in with your thoughts. In the meantime, thanks for all the great questions and comments. Keep ‘em coming! I was just thinking this question last week when I came across some fish in the grocery store. The label said, “wild caught” and the ingredients were simply “wild Alaskan sockeye salmon” but there was a small dose of 0.1 grams of trans fats. I got confused as to if there was something they weren’t telling me, but good to know that it can occur naturally and be healthy for you. So the trans fats in meat and dairy are different than those in Oreos? Do we know why these ones have health benefits while the artificial ones are detrimental? You can see the chemical make up on the right for Vaccenic Acid. Go down to the chemical part to see the chemical make up on trans fats. Now, the make up is REALLY REALLY similar between those two, but if you notice, that little double line is on “mountain” five in Trans Fat rather than “mountain” four on Vaccenic Acid. That difference is all that is needed to make trans fats indigestible to humans. Imagine my confusion when I learned that the CLA I was supplementing with is a trans-fat. Thanks for this explanation because I was guilty of the same over-generalization as the nutritional establishment. Thanks again Mark! Nice breakdown Mark. I knew that artificial trans fats were bad and animal trans fats were natural/healthy but wasn’t sure why. Just a point of clarification under the “What are they?” and “What do they do?” categories. As I understand it, the process starts with a polyunsaturated fat or fatty acid, i.e. one with multiple double bonds in the “cis” configuration. The hydrogenation process undoes some of these double bonds, adding a hydrogen to each carbon to create single bonds. If this process goes to completion, you get a saturated fat (that is not a trans fat). Thanks for this! I have studied some chemistry and that section bothered me too. Please correct this! Trans fats by definition are not fully saturated. They contain at least one double bond in the trans configuration. Unsaturated fats with cis double bond configurations have lower melting points than comparable saturated and trans fatty acids because the cis double bond causes a bend in the molecule, limiting intermolecular attractive forces. This bend is not present in saturated fats or unsaturated fats with only trans double bonds (hopefully that isn’t too confusing). “Research indicates trans fats cause comparatively more weight gain than the same diet with monosaturated fats” – I think you mean monounsaturated fats here. Feel free to shoot me an email if you want additional clarification. This post comes at a time when I was just questioning why there are trans-fats in most cheese. A person eating a ton of trans fat develops fat tissue that is harder in texture. A person skilled at testing body fat levels using a caliper would tell you that a guy eating at McDonalds everyday has a tougher feel to his skin fold. OMG- that’s sick. What if you developed this fat layer- will following the hunter/gatherer diet allow your body to flush this out? Your body does not know what to do with trans fats, so it puts it away as a toxin in your fat tissue. If you loose fat through diet and exercise, you will be able to loose it. It’s also important to have a good level of vitamins and minerals in your diet when you detox. 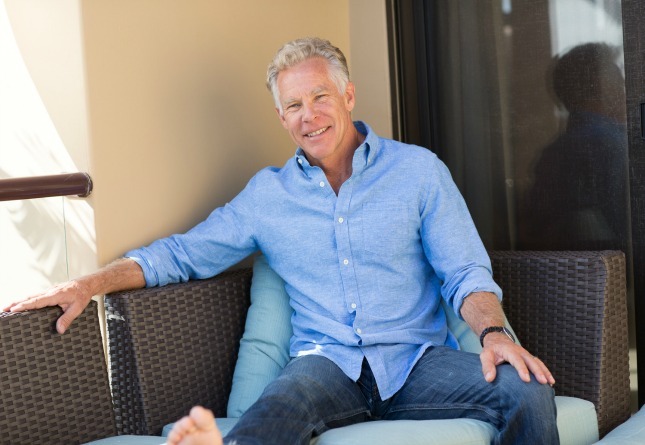 Funny as it may sound, when you loose body fat and try to detox, you could end up being more toxic with all the stored toxins from the fat tissue now ending up in your bloodstream. Great post. Thanks for providing the next level of education when it comes to this stuff. I’m always surprised (and irritated) to find how little I actually know… all the while thinking I was extremely well educated on a subject. Great post. Can’t get enough of the information! I’ve always thought it good to stay away from non natural fats. There include anything that needs to be cooked. We all know that partial hydrogenation is bad, but I would hardly say that a small-scale study that looked only at rodents and included no control group “proves” that animal-sourced trans fats are healthy. You shouldn’t need a grand scale study to have that proved to you. But to argue that things are ‘better’ simply because they are ‘natural’ is faulty at best. Poison ivy is natural. Hemlock is natural. So is cyanide. Tons of natural substances can make you sick or even kill you. I think it is generally good to stick to dietary and activity patterns modeled after those of our ancestors. However, if the tables were turned and this were a study proving the harm of saturated fat, most of this community would be extremely quick to point out how flawed the study is. You can’t have it both ways. Hold studies that you use to prove your points to the same standards as those you criticize from the opposition. Those are the ancestors who were dying at age 30, right? Studies don’t mean much when you know that humans evolved off animal sources, and animal sources do contain trans fats(very little). If it were harmful to human beings then we’d have adapted to handle the small amount you might find in them. At worst 0.1 grams of trans fat I find in some wild caught salmon is harmless. At best, it’s healthy and good for you. No macro or micro nutrient you find on any package is inherently bad for you. There are some you want to limit and some you want to have a plentiful amount of, but if the source is something we evolved eating, then you’re probably in good hands. That’s a reasonable way to look at it – and it is the principle of the primal blueprint, after all. You could avoid all animal fats because they contain a trans fatty acid, if you wanted to, but I think that would be quite silly. Another excellent and informative post! After being in use for awhile, it became clear that trans fatty acid had one strong drawback for our health. It raises our cholesterol, or rather it raises our bad cholesterol and lowers our good cholesterol. This can increase our risk for strokes, heart disease, and heart attack. I’ve yet to see these on food labels, but there are several new & upcoming hybrid/GM crops that produce “high stearic” oils without the trans-fat style processing you describe here. In particular is a High Stearic High Oleic Sunflower Oil that’s just entering the market, it’s actually semi-solid at room temperature and looks to have a very healthy fatty acid profile. so what happens if you accidentally eat it because a stupid relative put it in your food? Just so I am clear, trans fats in meat are ok to eat? But the trans fats occurring in that beef are naturally occurring and therefore ok to eat, correct? Interesting that you titles the article “Why are Trans Fats Bad?” but you didn’t address here why exactly they’re harmful to the body. Informative article nonetheless. Does natural occuring fats break down in our body? Could someone tell me why my cheese shows a small amount of trans fats in the nutrient analysis (Cronometer). I only eat raw cheese and thought it would just be a saturated fat, not trans.